Good chat with landlord before setting of at 10:00!!! Great ride across Exmoor – saw deer but no more ponies (Gerry used the trowel) Seagulls and cuckoos. Met LEJOGers walking uphill. After the Moors, we turned into Barnstaple. Lunch in Tapas Bar; brakes from Halfords – probably should have stayed out of the town as Tourist Office unhelpful and food expensive. Took Tarka trail excellent surface and good by the estuary. The old station cafes would have been better for lunch. Stopped at Bideford – Information and cafe closed.Booked camp ahead – Gerry slogged into town for provisions but fuel only enough to cook Macaroni cheese. Found camp after trek through woods. Big caravan site (We are having it as charity) Kind neighbours gave us hot water and made our porridge! Decamped by 930-100ish. Tarka fairly rough (I was feeling a bit ‘off’) Hot and dry. NCN3 left Tarka at Petrock Stone on to typical ups and downs. Stopped Sheepwash – very pretty but still mostly “For Sale” – for pasties and nibbles. Took NCN3 on old railway to Holsworthy – Waitrose didn’t sell meths for Trangia so walked up into town and had Fish & Chips, bread and butter pudding and a cream horn at Cousins Corner Cafe. I was feeling very weird and upset tum. “Info” shut at 1300 so too late. B&B in town on their list finished. Cycled on to Pyworthy and spotted B&B at Molescombe Inn. Took room – real ale (Muck & Straw). I stuck to soup – feeling better. Sunshine continues. Left Pyworthy 10ish. (No toast or cereal!) Stopped at shop in Bridgewater and on via Marham Church and now in Cornwall – last county! Lunch halt at Wisley Down PH at Hallworthy then Bodmin Moor – hilly, obviously. Interesting run past Davidstow Airfield. Stopped for a paddle in the old ford near Harpers Down. So hot – we cooled off with a paddle in this ford! “Tamy” B&B now only self-catering at St. Breward – chatted with shop owner’s son who had worked on Camel Trail ( also had ice-creams) decided to carry on and make Wadebridge (Cornwall Royal Show finished today) tried Travel Lodge – still full after Gerry’s strident ride up the hill – but found B&B halfway up – son had done end-to-end. Quick 2-for-1 supper at Travel Lodge. 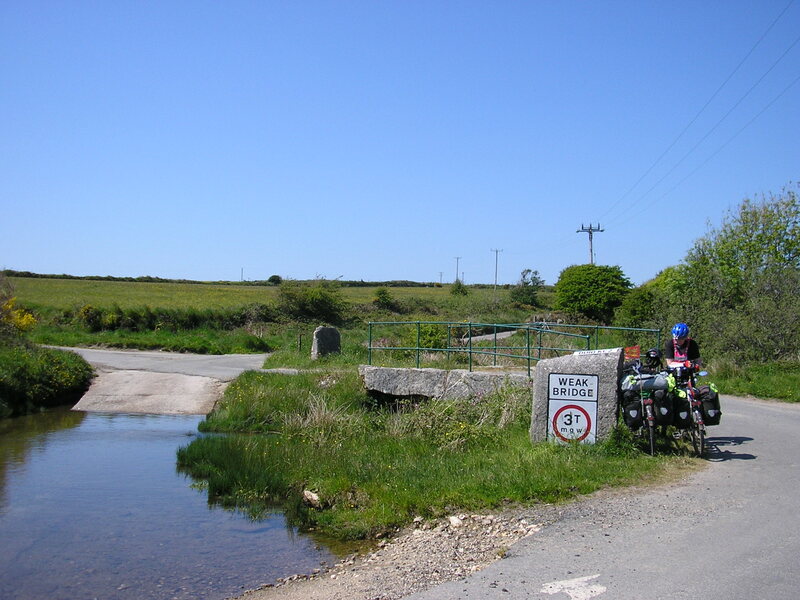 Will finish Camel Trail tomorrow – excellent Trail, especially the way we’ve done it, mostly all downhill. Old railway still has some tracks showing and there is a Heritage line near Bodmin. Warm and sunny again. Good run on rest of Camel Trail to Padstow. Shopped in St. Columb Major and on towards Newquay. Confusion on routes between map, signs and “Beep”(GPS). Chatted with local cyclist at Trebudannon. Decided to stay with route to Newquay – bit of a pain getting through – also first wrong turn and being “lost” – sorted after a bit of a back track. I was tiring – heat?? after Zelah. Quaint little lane into Truro. 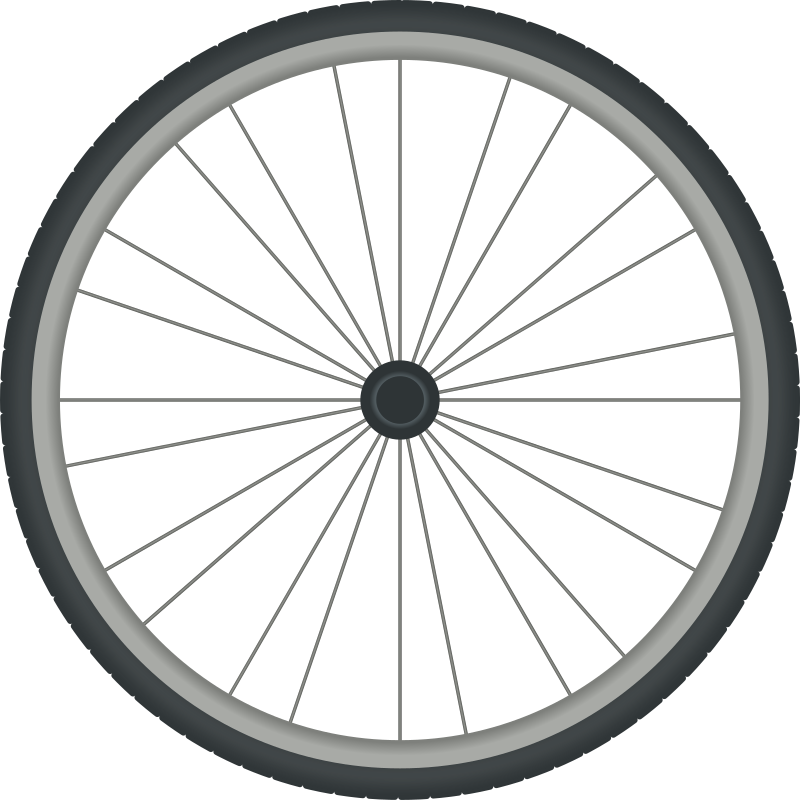 Paramedic on motorbike in town centre suggested guest house “Bay Tree” (Landlady “Ann” from Jersey – a lovely character, has had several end-to-enders, walking, cycling and all sorts) Pizza Express supper and WiFi to look up return journey. Tomorrow “Land’s End??? Mizzly and chillier. Ann gave us sandwiches and waved us off!! Took Chapel Hill route out and Tin Mine paths – coffee at Bissoe Bike Stop (not brilliant for Tourers) Interesting run through old mines and quarries but fairly slow through Redruth (a sister Janet moment) Higgledy-piggledy through Cambourne and a run to Hayle (seemed a nice seaside/estuary town – never heard of it before) tea and soup at Riviera cafe. 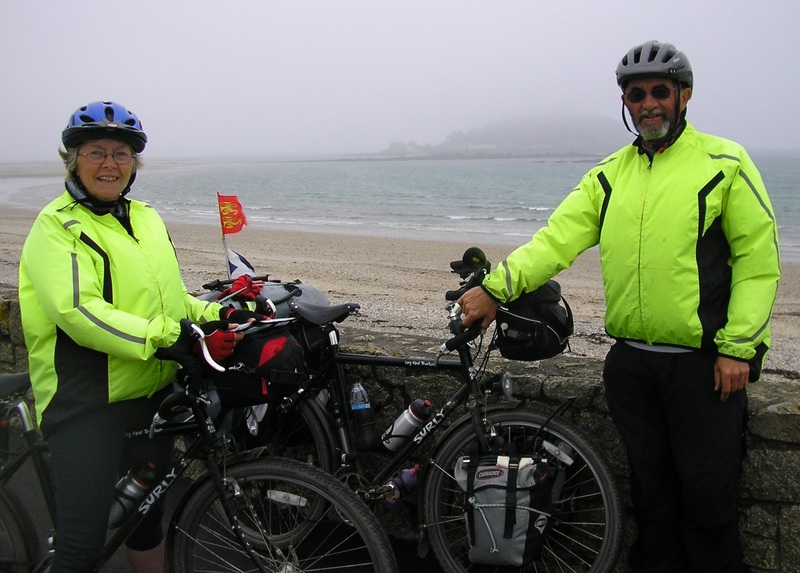 Good run from Hayle to Penzance, v. misty – only just make out St. Michael’s Mount – lady took our photos. Booked B&B at Duporth G.H. Bikes in Hallway. Breakfast already in room?!! (£70) Coast trail a bit bumpy back into town – checked out railway station – started drizzling. Planning for return trip after run to Lands End tomorrow. Back in waterproofs – St Michael’s Mount in the mist! building – nothing like the hoped for cafe to welcome “end-to-enders” bit of an anti-climax, but we did it entirely on the National Cycle Network!